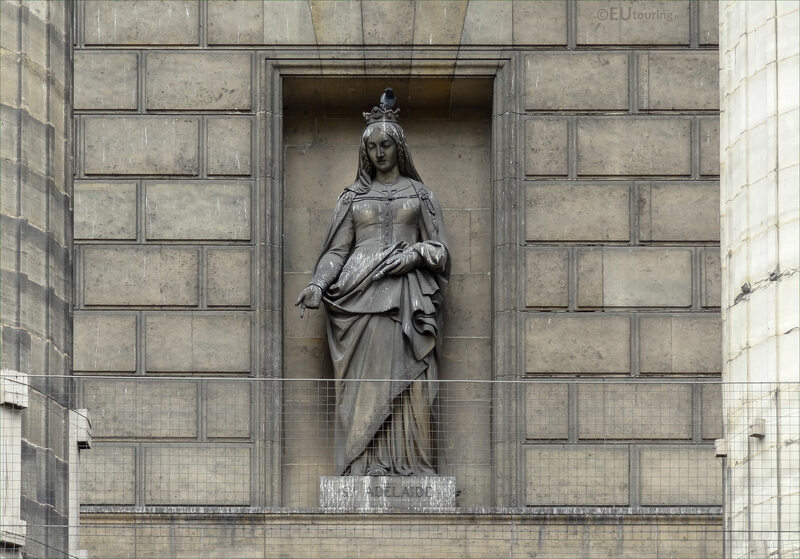 We were in the 8th Arrondissement of Paris at the Eglise de la Madeleine, when we took these high definition photos showing a statue depicting Sainte Adelaide, which was sculpted by Astyanax Scevola Bosio. It was the architect Jacques Marie Huve that wanted statues of saints to adorn the facades of the Eglise de la Madeleine, and partly inspired by the Orleans family while Louis Philippe d'Orleans, known as the King Louis Philippe was reigning, Saint Adelaide was chosen to be one of these as Adelaide was sister of the king, and in this first HD photo you can see the statue of Saint Adelaide. 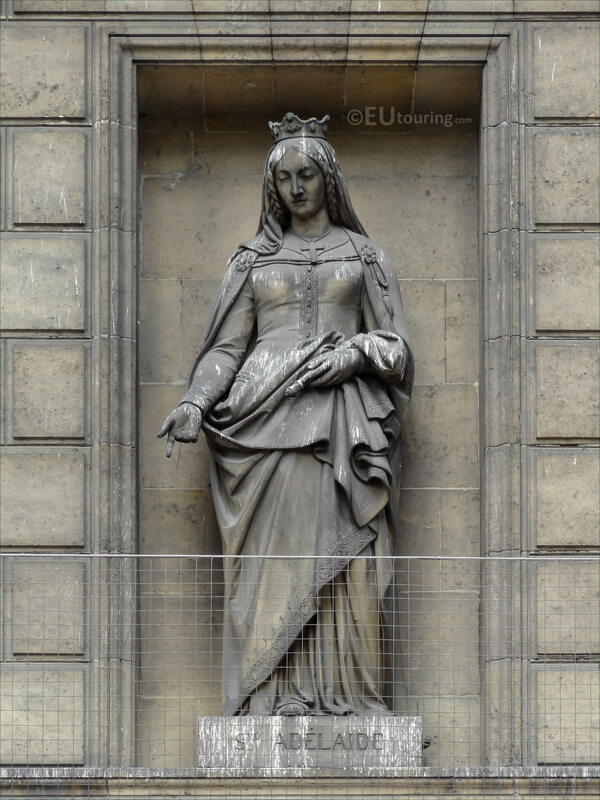 Different artists were commissioned by the French state to produce the statues of saints, and this one depicting Sainte Adelaide was produced by Astyanax Scevola Bosio who was born in Paris in 1793 and initially went into the army before turning to sculpture studying under his uncle Francois Joseph Bosio before entering the Ecole des Beaux Arts. Astyanax Scevola Bosio received many public commissions for famous tourist attractions in Paris including the famous Arc de Triomphe, Louvre Museum, Pont des Invalides and this one for the Madeleine Church that was produced in stone in 1840. 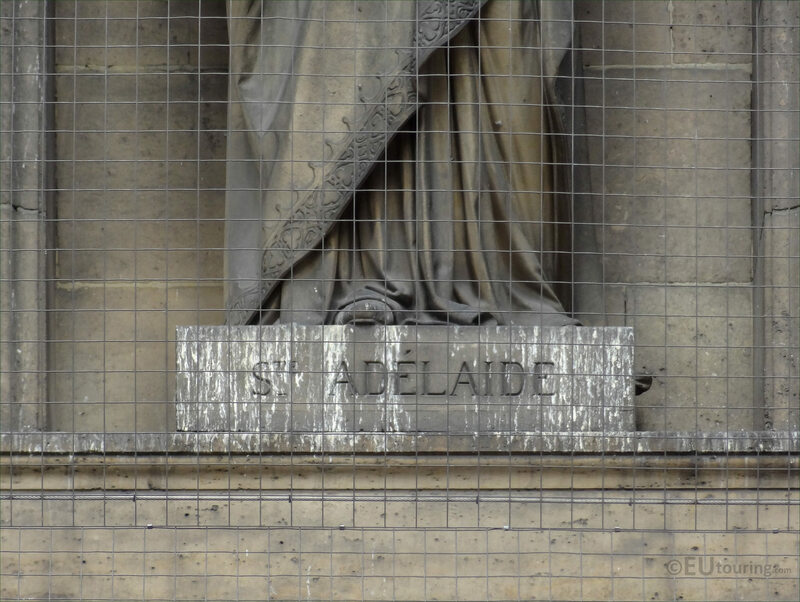 Now this close up photograph shows the pedestal base of the statue with the name of Saint Adelaide inscribed on it, and born in 931 she is also referred to as Adelaide of Italy and Adelaide of Burgundy and was crowned Holy roman Empress by Pope John XII in Rome in 962, plus was a regent for her grandson until he became of a certain age. But Saint Adelaide had many misfortunes during her life including being imprisoned after refusing to marry the ruler who was successor to her first husband who died after reportedly being poisoned, along with many problems between family such as her daughter in law, so Saint Adelaide, who was canonised in 1097, became a Patron Saint of Prisoners, Second Marriages, Step-parents and Widows, with her feast day being 16th December. 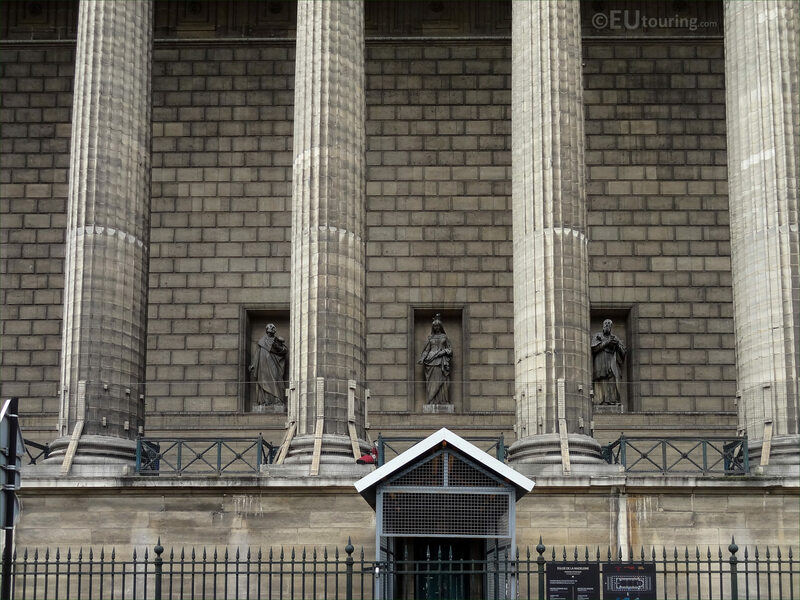 However, here you can see the position of the Sainte Adelaide statue located within a niche on the portico facade of the Eglise de la Madeleine, that can be seen through the recognisable Corinthian columns of this edifice from the square that carries the same name.